The Blu-ray 3D titles will no longer be hardware exclusives at the end of August. In an early announcement to retailers, 20th Century Fox has just revealed 'Ice Age: Dawn of the Dinosaurs - 3D' and 'The Chronicles of Narnia: Voyage of the Dawn Treader - 3D' will be widely available on August 30. Specs and supplements have yet to be revealed, but suggested list price for each Blu-ray 3D is $49.99. 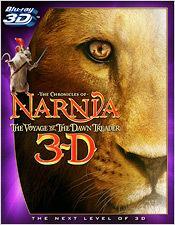 You can find the latest specs for 'Ice Age: Dawn of the Dinosaurs - 3D' and 'The Chronicles of Narnia: Voyage of the Dawn Treader - 3D' linked from our Blu-ray Release Schedule, where they're indexed under August 30.